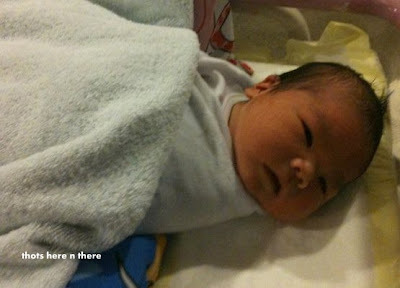 On 17th August 2010 at 3 plus in the morning, my nephew Ong and his wife, Janne became the proud parents of Wesley Pang. This bundle of joy weighs 4.1kg!!!! That's a real heavy baby. Come to think of it, I was Dan's age (11) when Ong was born. Both Ing and I helped sis to babysit him. He was a real chubby and cute baby. Wesley is an old English name. It is the family name of the founder of Methodism; John Wesley. Here is a famous quote of John Wesley : make all you can, save all you can, give all you can. Introducing the newest addition to the family : Wesley Pang. 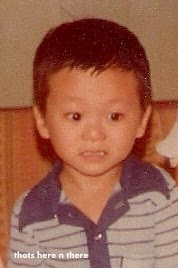 Here is the picture of his father .... see the similarity... especially the nose. Couldn't find any baby pictures of Ong, this is the closest that I can get of him in his young age. Don't have any pictures of Janne; so I can only make a comparison with the father. CONGRATULATIONS TO PETER AND JANNE! I baked two loaves of bread today. Need two loaves to feed the whole family. I thought I have this recipe in my blog but it was just the picture. So decided I might as well put the recipe down so I will not forget. I have been baking bread for years. But none of the recipes which I used earlier are with me....somehow I lost them. Maybe by blogging them, I will not lose the recipes anymore when I try out new ones. Bad habit of forgetting the old ones when I start a new recipe which I like. Again; this is for AJ7. I just remembered I tried a cappocino orange bread which is nice but didn't bake it anymore as Dan doesn't like the slight coffee taste in it. Will try it again soon and blog the pic and recipe. I bake it at 1kg weight...turns out ok. Slightly more dense than poppy seed loaf because it has lots of chocolate chip in it and also walnut. This is the loaf of poppy seed bread I baked just now. It's our favourite. (I have only two recipes which I use; no time to test out the rest). Makes good sandwiches. Below is the recipe; specially for AJ7. Bake at 1kg weight; takes 3.25hrs. (Remember to scrape down the sides when the machine is in kneading mode). I'm doing this review on behalf of Dan. This book is meant for kids aged 6-10. When he read that he said he's too old to read it. I insisted that it is good for him and made him read it. Haha...no regrets! He enjoyed it so much. He read some of the stories to me (which I didn't hear; as usual). He said some of the stories are real sad like the one where the friend moved away and the other one where the bird flew away (?). I am so proud that he could finish the book which has minimum pictures. Asked if he wants to read more, I could borrow from the library; he said no. Sigh. The school library is stocked with a variety of Chicken Soups. Selling like hotcakes. Introduced them to the Form 1 students and now I see so many of them holding the books. So good to see students reading. Passed by a class today and saw the teacher sleeping...literally. The head was on the table and blissfully unaware of the things around. Students were totally happy talking to each other. It was only slightly past 8am. Dan wants to iron his own blue shirt and asked me to teach him. Showed him how to iron just now and he managed almost all on his own ironing two shirts. All this is the result of being a prefect. The novelty of it....he thinks he should be indepandent and do more things on his own. I'm not protesting; I think this is really good. Who knows I don't need to employ Mila to do my ironing anymore!!! (Haha...fat chance....my clothes will be ruined). I wonder how long this will keep up. Anyway as he pushed the iron around the shirt, I watched and guided him and showed him how to turn the shirt around and how much pressure to put on the iron. Just so afraid that the iron will topple and drop on his feet or he irons his cute stubby fingers. The little boy who is a grown pre-teen ironing his shirt.